DNP Imagingcomm America Corp. cut the ribbon on a second coating line at its renovated Concord facility in North Carolina today. The company manufacturers a line of commercial dye-sublimation printers that use the thermal transfer ribbons produced at the plant. Ribbon Cutting. DNP launches the new dye-sub ribbon line. From left to right: Katsuyuki Oshima, president DNP Imagingcomm America; Masato Koike, senior corporate officer, Dai Nippon Printing Group and chairman, Imagingcomm America; and Kazuo Murakami, deputy general manager operations, Imagingcomm America. "Our dye-sublimation photo printing business has enjoyed significant growth over the past three years as the market converts from wet to dry photo processing," said DNP IAM President Katsuyuki Oshima. "DNP's investment in the Concord facility directly reflects our commitment to local production in the largest markets." Renovation of the Concord facility began in August 2015 following the acquisition of the building next door in May 2015 which allowed DNP to relocate some of its manufacturing processes, including the original coating line. While the new line is the same size as the original, it features updated controls and systems for treating the film, identifying defects and handling DNP's various ink formulations. The company has added 25 employees to handle the new work load as well. CONCORD, N.C. -- DNP Imagingcomm America Corp. has officially opened a renovated manufacturing facility at its headquarters in Concord, N.C. and initiated production from a new coating line, the second line installed at DNP's Concord operations. 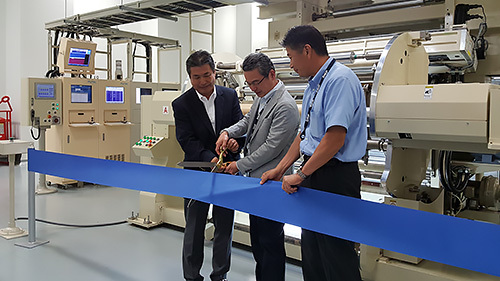 The new coating line increases production capacity for thermal transfer ribbons and is a direct result of significant growth in DNP's dye-sublimation photo printing businesses. "Our dye-sublimation photo printing business has enjoyed significant growth over the past three years as the market converts from wet to dry photo processing," said Katsuyuki Oshima, DNP IAM president. "DNP's investment in the Concord facility directly reflects our commitment to local production in the largest markets." Renovation of the production facility began in August 2015 following the recent acquisition of a new building located next door to the Concord headquarters in May 2015 that allowed DNP to relocate some of its manufacturing processes, including the original coating line. While the new line is of identical size to the original, it features updated controls and systems for treating the film, identifying defects and handling DNP's various ink formulations. The upgraded line will provide even better performance and reliability in the areas of safety, quality and productivity. The renovation and addition of the second line led to the addition of 25 employees at the Concord facilities over the past year. Additional staff members are expected to join the DNP family throughout as production volume continues to grow. "The addition of a new coating line for the production of our dye-sublimation photo print media represents a tremendous opportunity to continue growing DNP's business in multiple markets throughout the Americas," said Garrett Lyons, DNP IAM vice president of operations.